Everyone knows how expensive wedding invitations can be—and how frustrating it is to spend money on something you’re sure the recipient will throw away immediately. But believe it or not, the invitation is one of the most important parts of your wedding: it’s the guests’ first introduction to you and your beloved’s big day. It lets people know what to expect—so give them an invitation that’s as beautiful, fun, and creative as your wedding will be! Going somewhere for the big day? 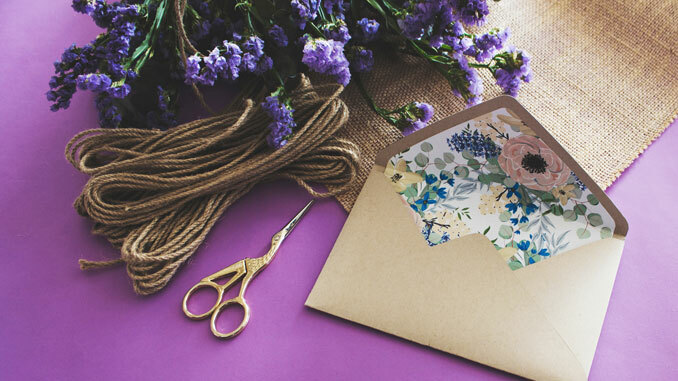 Let your invites reflect that with scenic print on the inside of the envelope. If you’re holding the wedding abroad, get creative with the invitation and make it look like a little passport! This type of invitation has a personal touch and actual use—you know, for all the happy tears that will be shed during the ceremony. It’s also a great old-timey keepsake that your guests will actually want to hold onto forever! As delicate and decorative as it is informative, a laser-cut invitation is an adorable way to let guests know you’re tying the knot, and something they’ll happily hang on their fridge! You can laser cut anything, from stationary to wood, and in any shape your heart desires. Nothing says class like an invite made of glass—well, it’s not glass exactly, but acrylic is just as transparent and won’t break en route! You can custom order this 1/8th of an inch-wide invite to say whatever you’d like it to, and you can bet it will be something your guests will cherish. Consider it if you’re planning a minimalistic wedding. Puzzle Invite This one should only be used if you’re sure your future guests are the type of people to be intrigued by puzzles. If so, give them a game to play while they read your invitation! There are many websites where you can create your custom puzzle the size of an envelope—use a photo of you and your future hubby, and don’t forget to write the details!